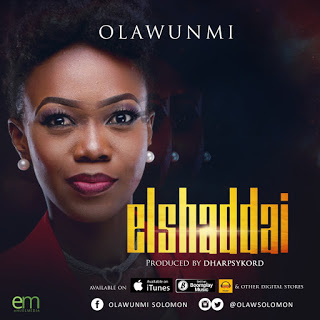 El Shaddai “God Almighty”; the compelling follow up to her 2016 chart-topping debut single “Restorer” is an intense worship song that draws the heart of every listener close to the heavens, calling on the most high God. “El Shaddai” would remain atop your playlist for a long time! ‘OLAWUNMI’ – full names ‘Olawunmi Elizabeth Solomon’ is a recording artist, songwriter and songs minister with great vocal dexterity and anointing, a computer scientist and entrepreneur. Olawunmi professionally launched into the Gospel music industry in 2016 with a single titled ‘Restorer’. She has a calling to churches & a few of the platforms she has ministered on are COZA, Global Harvest Church, Daystar Christian Centre to mention a few alongside various Gospel acts. She is presently a worship leader at Enthronement Assembly Ikeja Lagos.